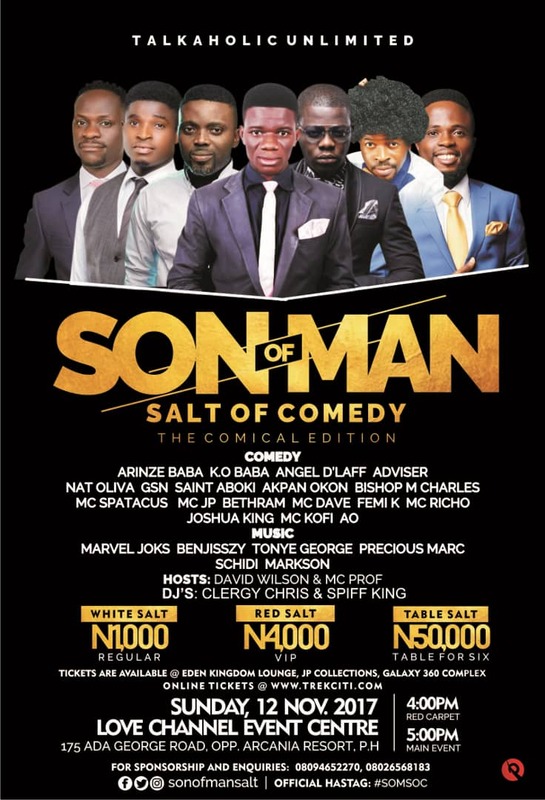 SON OF MAN SALT OF COMEDY (the Comical Edition). Son Of Man, one of the popular faces when it comes to comedy in the city of Port Harcourt. He is popularly known as the Mr Handsome, with appearances on different high class shows in Nigeria. He is set to host the city of Port Harcourt with his coming event tagged 'Son of man salt of comedy'. With this, he promises to storm Port Harcourt with a different style of comedy. Below is details of the event and how to get your pass to this top flight event. Arinze Baba, Ko Baba, Angel D'Laff, Adviser, Nat Oliva, St Aboki, Gsn, mc Spatacus, Akpan Okon, Bishop M-Charles, mc JP, mc Dave, Bethram, Joshua king, Femi K, Mc Kofi, Ao. Marvel Joks, Benjisszy, Tonye George, Precious Marc, Markson, Schidi. Hosts: David Wilson & Mc Prof.
Dj's: Clergy Chris and Spiff King. Venue: Love Channel Event Centre 175 Ada George road opp arcania resort, Port Harcourt, Rivers State, Nigeria.